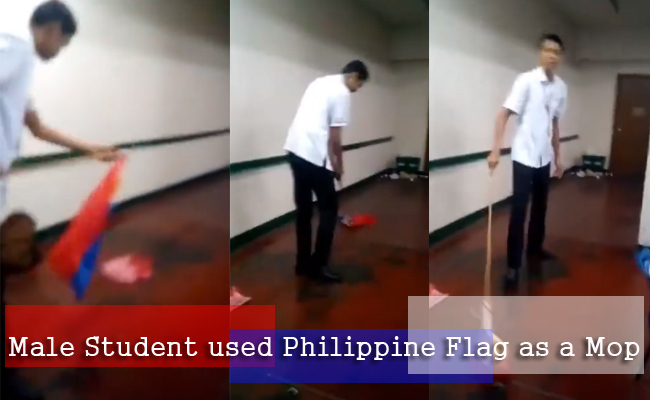 But it looks like not everyone is aware of the existence of the law because lately, a video of a male student who used the Philippine Flag as a mop has gone viral on social media. The video is posted on the Facebook Page of Filipino Netizens. The Philippine Flag was attached to a stick as he started mopping it on the floor. It is assumed that it was all a prank because giggles can be heard in the background. Someone even cursed “Gago” before the video was cut. However because of the low quality of the video, the identity of the student is still to be known. A lot of the netizens expressed disappointment and hate towards the (assumed) minor. Meanwhile, other netizens find overreaction toward others’ comments and said that they also need to apply and to practice patriotism in real life.